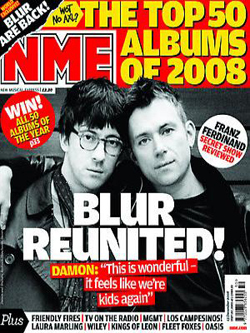 Confirming six years of rampant speculation, Damon Albarn and Graham Coxon have just announced to NME that they’re re-forming Blur — who’ve been on hiatus since Coxon quit in 2002 — for a reunion show in London’s Hyde Park next July. “It just felt it was right again,” says Albarn. “It somehow feels like there’s something for us to do again, we’re not completely useless or pointless, we’ve got a reason to exist.” Let’s hope their raison d’être is an album of Parklife-quality new material and not the recent lack of market demand for Chinese monkey operas and Buzzcocks-aping power pop (even though we like both of those things!). We hope they do a New York show, if only because we love Blur and they’re not really famous enough in America to play anyplace larger than Hammerstein.